I made this meal for what I like to call the Blizzard Bust of 2015 — when everyone said New York City would get three feet of snow and we got a couple of inches. Meanwhile, everything shut down — subway, no cars allowed to drive on streets after 11 p.m., etc. etc. I looked out the window the next day, and…nothing. Whomp, whomp. Quite the anticlimactic event. And I was rather excited, actually! My first blizzard in 12 years! The plan was to curl up on my couch and get snowed in, drink a few glasses of wine and cook myself an amazing dinner. And that I did, despite the snow bust. 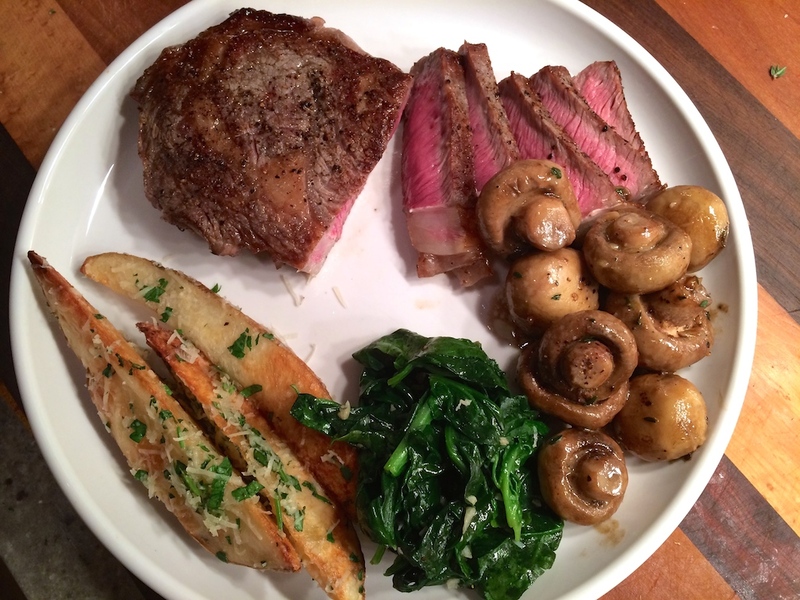 This is a nice little indulgent meal for a night in, recipe courtesy of Tyler Florence. 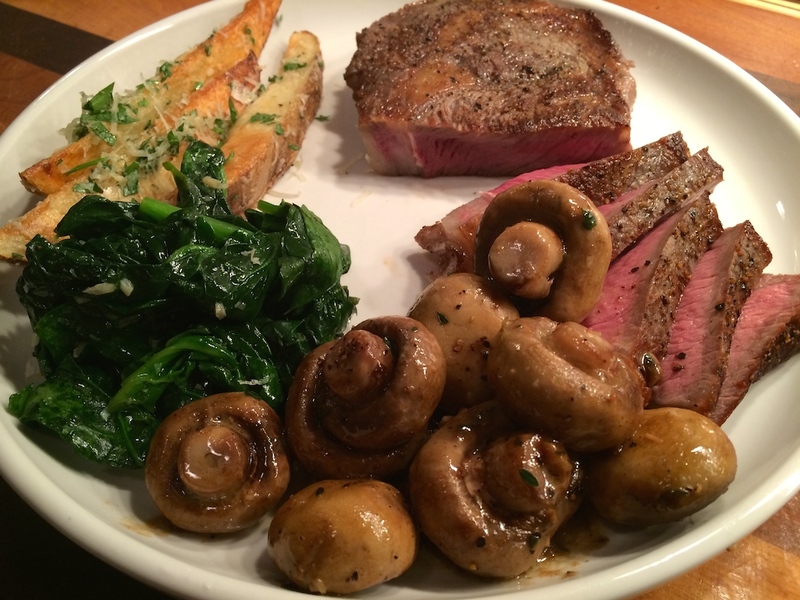 The steak is seasoned simply — salt and pepper — and the mushroom sauce is just awesome. It’s got great flavor from the garlic and thyme, and is fantastic alongside the crunch from the oven fries, seasoned with parsley and parmesan. Heat 2 tablespoons oil in a large saute pan over medium-high heat until smoking. Sprinkle the steaks all over with salt and pepper. Put the steaks in the pan and cook, turning to brown all sides completely, until medium-rare, 8 to 10 minutes depending on how thick the steaks are. Remove the steaks to a platter with tongs and cover loosely with a tent of aluminum foil to keep the meat warm while you make the sauce. Put the saute pan back over medium-high heat and add 1/4 cup olive oil. When the oil is smoking, add the mushrooms and cook, stirring, about 10 minutes, until golden brown. Then add the thyme and garlic, and season well with salt and pepper. Toss a few more times to cook the garlic, then dump the mushrooms out onto a platter. Take the pan off the heat, add the brandy, and cook until almost evaporated. Add the cream and cook that down 2 to 3 minutes until reduced by about one-half and thickened. Return the mushrooms to the pan with whatever juices have collected on the platter and simmer the whole thing another 2 minutes until thickened again. Season with salt and pepper. Slice the steak thin against the grain. Taste the sauce for salt and pepper and serve. 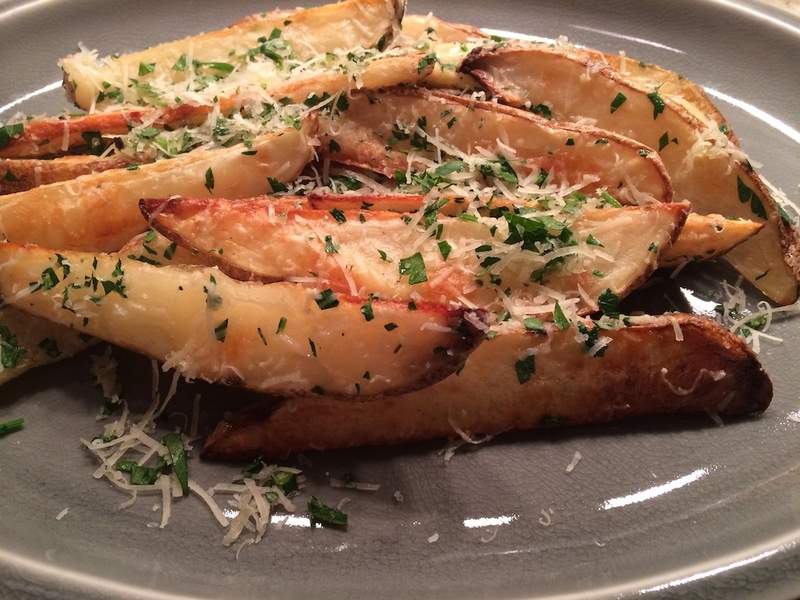 While the baking sheet is heating, toss the potatoes with the olive oil and 3/4 teaspoon salt in a large bowl. Then dump the potatoes out onto a baking sheet, spreading to a single layer. Roast for 30 to 35 minutes, shaking the pan every now and then, until the potatoes are cooked through, brown and crispy. Toss the fries in a big bowl with the parsley and cheese.